Anyone seen this bit of paperwork before ...interesting bunch of rifles there . Exactly my cup of tea. I have the M656 Air Force Carbine without forward assist and with fixed stock, a very nice model. These MGC ABS series is lighter than the HW series, but I heard they are not so prone to breaking. Think I´ll have to keep my eyes open for a XM177 version. I propably have seen too much Nam stuff when I was young ..
"It's a hardball world, son. We've gotta keep our heads until this peace craze blows over." That's quite a range of variants isn't it? Why so many though? It's difficult to imagine a need for so many variants of the same gun in any military situation. I know the M16A1 is a long rifle, the M16A2 had 3shot burst (did it?) the collapsable stocks and shorter barrels make for better CQB situations in buildings and vehicles I know, but it must cost the Military a fortune buying so many very similar weapons. 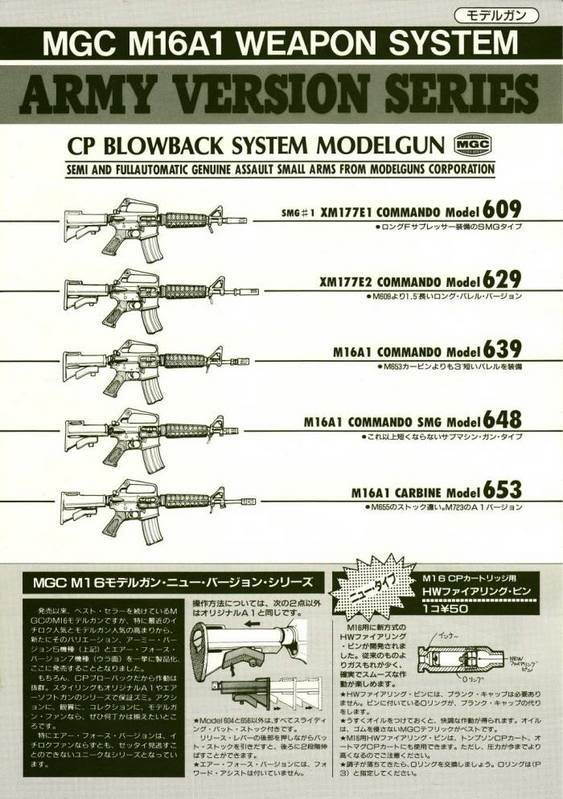 I know my post doesn't fit in with the "Modelgun Instructions" thread but seeing DOC's list of these MGC models got me wondering. Maybe my post needs moving to General Firearms? Hobby collector of mainly WW2 era uniforms, headgear, field equipment and replica weapons. Not all versions were really adopted by US military. I doubt if all MGC models have real models anyway. But MGC was true enough not to stamp "Property of US Govt." on the models which were not adopted by US military. For example the M655/M656 Carbine with fixed stock, 14,5 inch barrel was never adopted by US forces, but exported on a very limited scale. And the real model was named M651, most Japanese modelgun companies are wrong with the term M655. The Army had the XM177E1 and E2 in Vietnam in small numbers, although the gun was well liked with the troops. 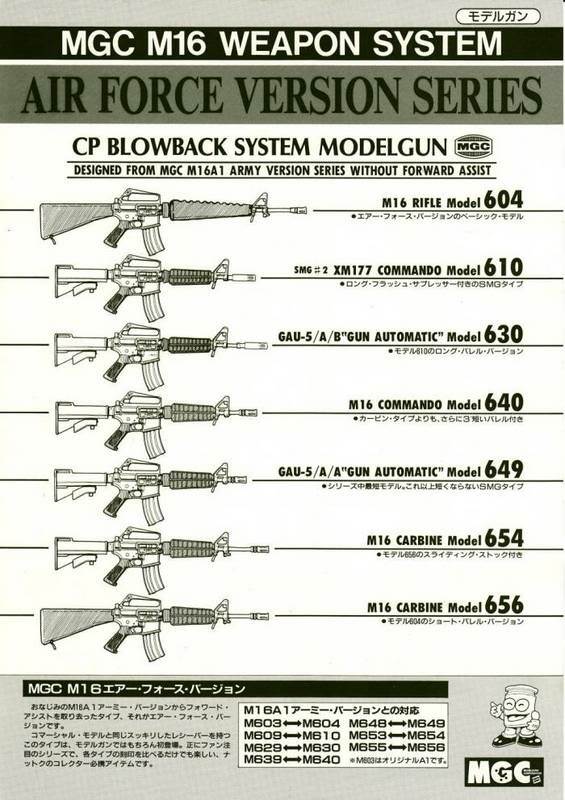 After the Vietnam war these models were discontinued and replaced by Colt with the M653 M16A1 Carbine which was exported on a larger scale (Israel, Philipenes etc. ), but saw very limited use with the Army at some SF or Ranger outfits. Then there came the M16A2 version M723/725 and the well known short M733, but these too saw very limited use with the US Army. In Desert Storm this carbine was not common at all, although some SF units used it (along with HK MP5 SMGs, sniper rifles and shotguns). Anyway you can find a large number of different carbines with the Air Force, which comes because they changed flash hiders and whole barrels on older models, creating hybrid models. They use these models for guards mainly, as well as with combat air controllers who often have new models, not reworked A1 versions. Israel still uses modified A1 Carbines on a large scale. Only some SF units have true new M4A1s there. Carbines (shorter barrel and collapsible stock) were not common with line units until the Second Gulf War which saw the introduction of the M4A1 Carbine on a large scale. They were limited to special operations personal as well as higher staff officers until then. You certainly know your AR-15s well my friend! Very interesting read this, hopefully I'll not stray too far off topic again but apart from the Forward Bolt Assist facility and Full Auto or 3 Shot burst limiter, does the entire range use the same basic upper and lower receiver set with the same trigger and magazine well? Yes, the A1 series are identical, all full auto. The Air Force versions lack the forward assist, the Army versions have it. Stocks, barrel length and hand guards with hand guard retaining ring (A1 version or Delta style) as well as flash hiders are different. Markings on the lower reciver are different too.